Do you want to slim down and tone your body? It's not necessary to spend hours running on a treadmill or performing long cardio training routines. There are many other ways that can help you obtain your weight-loss goals. It's better to try resistance training, which not only sculpts your body, but also improves your stamina and strength. That is why, in this article, we will show you five amazing exercises that can help you slim down, build muscles, slow down aging and look fit! In order to perform these exercises, you don't need to go to the gym or buy any special equipment. It’s easy to perform them from the comfort of your own home. These moves are called ‘compounds movements’, which means they are targeted at multiple muscle groups. You should include these exercises in your training routine to accelerate fat burning. This lower body training routine consists of effective, easy-to-follow exercises such as squats, lunges, skaters and low lateral lunges. 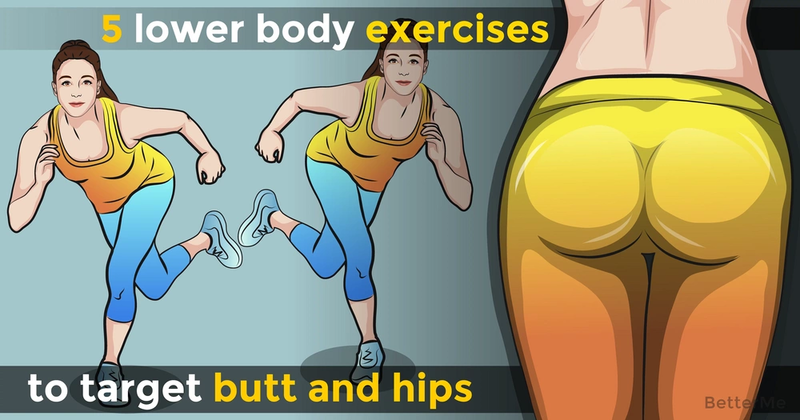 These exercises will tighten up your buttocks and tone your hamstrings. You should do fifteen reps of each move and repeat this set of exercises three of four times. If you want to get noticeable results in one month, you should do this workout five times a week. Before you start, we should remind you to perform a three-minute warmup that will help you avoid getting bone and joint inquiries. Are you ready to start exercising? No more excuses! Scroll down to read the instructions to perform exercises correctly.